Fathom Events recently brought Ponyo back to the big screen as part of this year’s Studio Ghibli Fest. For more information on upcoming dates,click here. When young Sosuke finds a goldfish trapped in a glass jar, he rescues her, takes her home, and names her Ponyo. This is a magical goldfish, though; she has healing powers, loves eating ham – and learns how to talk. Ponyo decides that she loves Sosuke, and she would be content to live on land with him. However, her father, Fujimoto, wants to get her back. Fujimoto is a wizard and scientist who was once human, but now lives underwater. He is eager to reclaim Ponyo. 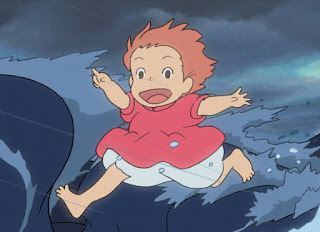 Ponyo desires to return to Sosuke, and the strength of her desire combines with her magical abilities to create a great storm – and to turn Ponyo into a human. Will she be able to stay that way? Sosuke finds Ponyo in a dangerous situation. He provides her safety, and names her Ponyo. When Ponyo returns to her home, she refuses to allow her father to call her by her birth name. 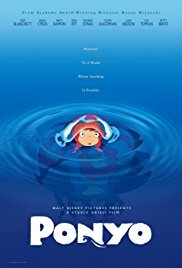 Sosuke, Ponyo, and their families must make sense of what has happened, and Ponyo’s parents must decide whether Ponyo can remain a human. Sosuke and Ponyo are both brave. We learn that Ponyo’s father is caring – even though he seems creepy and even though Ponyo describes him in frightening ways. Some frightening storm images could be unpleasant for young viewers. The uncertainty that surrounds whether Ponyo can stay with Sosuke or if she must return to her birth family could be difficult for some viewers who have had instability of family status. For a season, Sosuke is separated from his parents. Even though he is only five years old, his mother leaves him and Ponyo alone during a storm while she goes off to check on the seniors at the center where she works. Ponyo is a charming but sometimes scary story about an unlikely, magical friendship. Some viewers who have been touched by adoption may find parallels as Ponyo adjusts to being in a new world and as she takes ownership of her new name. Although some frightening scenes could make this one uncomfortable for some young viewers, Ponyo seems likely to be OK for most kids ages 10 and up. Why did Ponyo love Sosuke? Why did Sosuke love Ponyo? What do you think it was like for Ponyo to be in a new home? 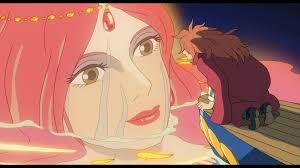 Do you think Ponyo will miss Fujimoto and Granmamare? Do you imagine that they’ll find ways to see each other?